As its name suggests, here is where you look to get details about programs not responding, or hardware that’s failing, in fact anything that affects the system’s reliability. One of the best features of the Reliability Monitor is its ability to keep data for months, thus the graph not only shows trends, but also tracks-back to when a problem started. 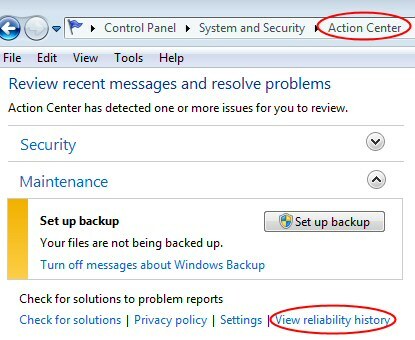 In Windows 7 Microsoft uncoupled the Reliability Monitor from the Performance Monitor; consequently the place to check the readings is via the Control Panel –> Action Center –> Maintenance, View reliability history. See screenshot below. Alternatively, type ‘Reliability’ in the Windows 7 Search dialog box, then click on ‘View reliability history’. 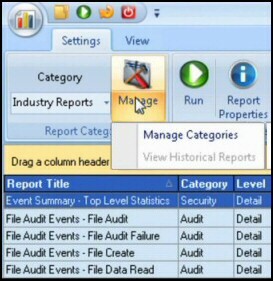 The	Reliability Monitor will display a timeline of application failures, and shutdown problems. The Windows 8 version collects the data using WMI (Windows Management Interface) and this explains why there is no executable such as resmon. WMI also enables you to collect reliability data using Windows PowerShell scripts. The reliability monitor also collects information about hardware and software updates. All this makes this monitor more finely tuned compared with its Vista equivalent. Incidentally, if you subscribe to the Customer Experience Improvement Program (CEIP), these are the data events that get sent back to Microsoft. The chart above show just one Windows failures, this is why the blue line drops below the maximum of 10. The display shows five categories of information: Application, Windows, Miscellaneous failures, Warnings and Information. The chart defaults to Days, however it’s easy to switch to Weeks. The Reliability monitor is great for troubleshooting intermittent problems such as programs hanging or hardware freezing. It’s killer advantage is that you can go back in time and see when the problem started. For detailed information about the failure itself double click on the red cross. When you do find the fault, then you can match the data with other troubleshooting tools such as looking in the event logs, or looking for a restore point just before the first failure. For some users it’s a badge of honour to obtain and keep a scorecard of 10. My feeling that this may be at the expense of not using a machine to it’s full potential. Guy says it’s better to work normally even if this means suffering a few failures which you then eliminate, or else just accepting that Internet Explorer does hang once in a while. In Vista there was a bug whereby the System Log jammed and in turn, stopped the Reliability Monitor, fortunately this error has been corrected in Windows 8. Decide whether you want to preserve the data, if so then copy or backup the PublishedData and StateData sub-folders. Select all the files in the	C: \ProgramData\Microsoft\RAC\PublishedData folder. Right-click and delete. Now that you have reset the Reliability Monitor it will start recording new data automatically. Drill down into event details showing a critical event, Video hardware error. The Reliability Monitor is a neglected tool for troubleshooting when a problem started. It’s also interesting to literally keep the score of application and hardware errors. 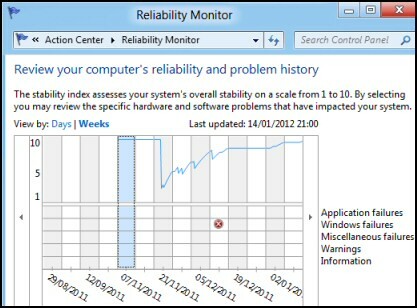 What’s new with the Windows 8 Reliability Monitor is that it has been uncoupled from performance monitor, and has it’s own place in the Action Center, Maintenance, View reliability history.